LAS CRUCES, N.M. – New Mexico State used a fast start on offense and stifling defense to bounce Grand Canyon 85-63 Thursday evening in Western Athletic Conference action at a raucous Pan American Center. The Aggies were bolstered by the return of All-American Daniel Mullings from injury. The Toronto native scored 17 points on 4-of-5 shooting from the field after a two-month absence. He did the majority of his damage from the charity stripe converting 8-of-10 free throws. Mullings was excited to return to competitive basketball and help his teammates. From the opening tip to the final whistle it was all Aggies. NM State jumped out to a 4-0 lead and held a 13-6 advantage at the 14:50 mark. GCU gradually pulled to within one at 13-12 at 14:01, however the Aggies went on a 15-2 run over a six-minute span and led 28-14 with eight minutes remaining in the first stanza. NM State controlled the rest of the half and entered intermission with a 41-27 lead. NM State (11-10, 3-1 WAC) defense kept GCU off-balance throughout the first half. The Aggies forced seven turnovers, which turned into 11 points. NM State also dominated in the paint with 20 points and 20 rebounds – including 10 offensive boards. NM State continued its dominance in the second half and eased to victory. The Aggies also had a total of five players finished in double figures. Pascal Siakam finished with a game-high 18 points and 11 rebounds – his fourth double-double of the season. Tshilidzi Nephawe dropped 15 points and hauled in 10 rebounds for his second double-double of the season. Remi Barry helped out with 14 points and nearly missed with double-double with nine rebounds. Ian Baker scored 13 points and was a perfect 4-of-4 from the free-throw line. For the night NM State shot 50 percent (29-of-58) from the floor. DeWayne Russell and Joshua Braun each scored 18 points to lead the ‘Lopes (11-9, 2-1 WAC). 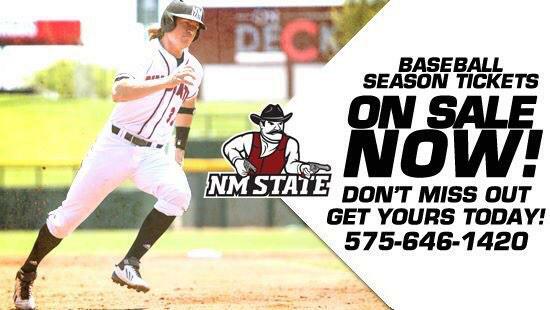 NMSU hosts Utah Valley Saturday Night at 7PM. It is wear Neon Night. There will be at least two surprise promotions. Daniel Mullings passed Wendell McKines for eighth on the NMSU career scoring list tonight. Mullings now has 1,531 career points.